I’m terrible at cooking human food, but there is one type of cooking I’m pretty good at; making dog treats. Unlike my friends and family, my dog never complains about my toast being burnt, my sauce being runny, or my treats being overdone (dogs are just awesome that way). I hate to say it, but it’s beginning to feel a lot like fall around here. And one of the first things that comes to mind when I think of fall is pumpkin (and scary costumes, skeletons and ghouls, but that’s beside the point…). And when I think of pumpkin I think about all the great pumpkin dog treat recipes I’ve made over the years. Pureed pumpkin (with no added sugar) is one of my favorite ingredients to use in dog treats. It’s nutritious for dogs — it’s high in fiber, low in fat, and loaded with beta carotene, magnesium, potassium, iron, zinc and vitamins A and C. And the high fiber content in pumpkin can benefit your dog’s digestive track, which is why it’s often recommended for dogs with stomach issues such as diarrhea. Pumpkin is a great ingredient to use in dog treats. 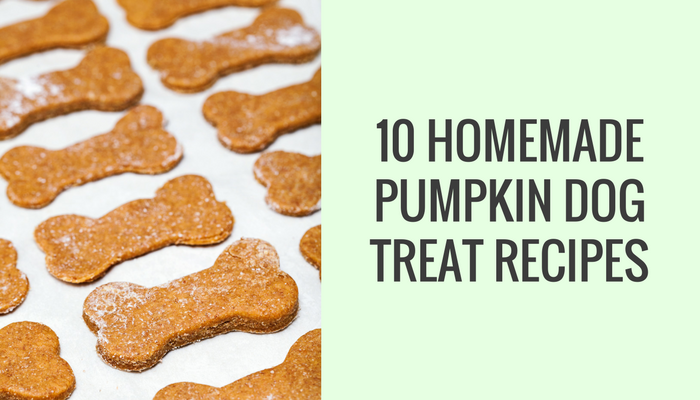 From grain free to frozen options, here’s 10 homemade dog treat recipes made with pumpkin. 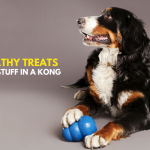 And if you’re interested in even more homemade dog treats be sure to check out our list of 25 easy dog treat recipes & 39 healthy snacks you can stuff in a Kong. These homemade pumpkin dog treats are are easy to make, and they’re a big hit with my dog because she loves anything with peanut butter. If you’ve got some canned pumpkin, eggs, flour & peanut butter give this recipe a try – your dog will definitely thank you for it. 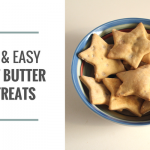 This dog treat recipe is one of my favorites – it yields a bunch of great smelling, bite sized treats that are perfect for using as training rewards. If you’ve got some pumpkin, egg, shredded carrots and whole wheat flour give this recipe a try. Four ingredients, 30-35 minute bake time. If you’re looking for a pumpkin dog treat recipes that does not use peanut butter these biscuits are a great choice. They’re super easy to make, and my dog went bonkers for them (these get extra bonus points for dogs that like their treats to be crunchy). These banana & pumpkin dog treats will make your kitchen smell delightful (if you’re a fan of bananas like me that is). This is another treat recipe that does not use peanut butter, but does include honey & banana. If you’re looking for simple this recipe is the way to go. With just 3 ingredient’s it’s the easiest on this like to bake, and my dog absolutely loved them. This recipe is probably the most delicious to dogs on list because they’re drizzled with a peanut butter bacon glaze (I don’t know if there’s any combination on earth my dog loves more than bacon & peanut butter…). 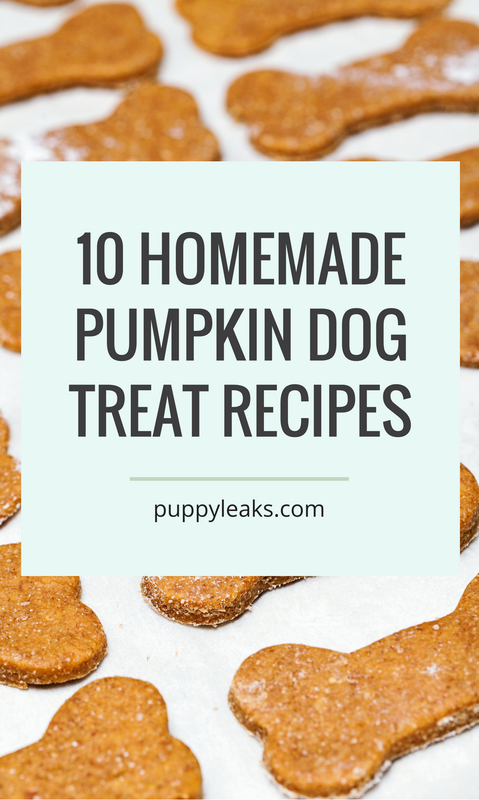 Does your dog love pumpkin and apples? If so you’ve got to try this sweet recipe. They’re easy to make and smell delicious, and unlike most dog treat recipes these ones are made with oatmeal rather than flour. Does your dog have grain allergies or sensitivities? If so you’ve got to give this grain free pumpkin dog treat recipe a try. They’re easy to make and my dog went nuts for them. Looking for a gluten-free dog treat recipe? Give these pumpkin dog biscuits a try. They’re easy to prepare and smell delicious. Not a fan of baking? Give these no bake pumpkin dog treats a try. It uses just 2 ingredients and some freeze time; it doesn’t get much easier than that. 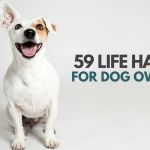 Some of these dog treats recipe use peanut butter, and for the most part that’s fine. However, there are a few brands of peanut butter that contain xylitol, an artificial sweetener that is extremely toxic to pets (it’s also found in many sugar free gums & candies). Small amounts of xylitol can be fatal to dogs, so please double check your peanut butter label to make sure it does not contain xylitol. Looking For More Dog Treat Recipes? 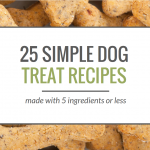 If you’re looking for more simple dog treat recipes be sure to check out our big list of 25 homemade dog treat recipes, all made with 5 ingredients or less.